In 1886, Richard Sears was only 23 years old when he negotiated with a company to sell their gold filled watches to the station operators of the Northern Pacific Railway. Within six months he had netted over $5000 and went on to found the R.W. Sears Watch Company. The following year he moved to Chicago and hired Alvah Roebuck as his watch repairman. In 1891 they formed the Sears Roebuck & Co. They published their first catalog containing only watches in 1893. By 1897 it had grown to become a diverse 500 page catalog that was sent to 300,000 homes. 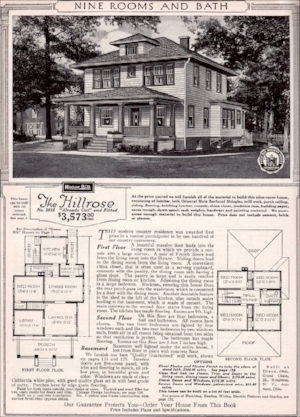 By 1908 it was even possible to buy a mail order home from Sears and Roebuck. Sears' first retail store opened in 1925 and by 1973 Sears' name was on the tallest building in the world. It was only a couple of hundred miles from the original train station where Richard Sears got his start. Then Wal-Mart and K-mart exploded onto the scene and by 1992 Sears had experienced $2.3 billion in losses and cut 47,000 jobs. In January 2017 Sears sold their iconic Craftsman brand to Stanley Black & Decker for nearly $900 million. They continue to bleed red ink and most analysts anticipate that they will declare bankruptcy before the end of 2017. In physics "resilience" is defined as the ability of a material to return to it's orignal shape after being stressed. Has Sears been resilient? Yes, absolutely. After all, Sears has been in business over 115 years. Despite years of financial losses they are, as of this writing, still in business. But they have failed to adapt. Why didn’t they become the biggest online catalog company of all time? Why didn’t they become Amazon? It is not enough to be resilient. It's not enough to "bounce back". Organizations and the people that work for them need to innovate and adapt. With the rapid change in healthcare we are seeing an increasing number of people that are becoming burned out, disillusioned and disengaged. The bad news is that it is not possible to adapt without being engaged. When people are disengaged they grumble about everything they don’t like. Their vision actually becomes narrowed by convergent thinking which focuses on problems, limits innovation and blinds them to opportunity. As people become more engaged, they begin to use divergent thinking which increases their field of view and facilitates new ideas and creativity. Without engagement there can be no innovation. It is time to become engaged. We need you. I would love to send you a copy of my Fired Up or Burned Out?.